Home › Economy › Will Finland continue to oppose last-minute compromise with Greece on Monday, when Russia announced it could help Greece? Will Finland continue to oppose last-minute compromise with Greece on Monday, when Russia announced it could help Greece? The situation in Greece is becoming difficult. The population begins to prepare for an exit of the eurozone, as the last negotiations failed. The reserves of the Greek banks were on Saturday nearing 3 billion euros, with one billion withdrawn from the accounts on Thursday. A last minute relief agreed by the European Central Bank will give the government three or four more days before putting in place a control of the movement of capital, and the fate of Greece will probably be decided on Monday, in what is called the “last chance” European summit. On one side, the European authorities, Germany and the International Monetary Fund are applying a maximum pressure on Greece. German Chancellor Angela Merkel has urged for a deal before Monday Summit. According to Spiegel online, her Finance Minister Schäuble is convinced that Europe can only succeed if everyone abides by the rules and Greece is prepared to accept what he calls “conditionality,” in other words, that credit depends on Greece respecting the terms of its creditors. In the UK, the Sunday Express mentions that Prime Minister Cameron prepares for a “Grexit”: a spokeswoman for Prime Minister David Cameron said a Greek exit from the single currency “would represent a serious economic risk to Britain” and that the UK Government is “stepping up preparations given where discussions have got to“. The British government is looking at the consequences of Greece’s possible withdrawal from the eurozone on British businesses, banks, financial sector and tourists was being looked at. Are our negotiators really able to work at the level required? In addition, a number of comments are questioning the handling of the Greek situation by the International Monetary Fund (IMF), the European Commission and the European Central Bank (ECB), coming in particular from the Americal Business magazines. Fortune in particular has published an article that everybody in Finland should read, with elements given by one famous economist James Galbraith, Harvard, Yale and Cambridge-educated son of legendary economist John Kenneth Galbraith, and Professor of Economy in Austin, Texas, who has followed inside the Greek team the negotiations with the EU. Fortune writes that “For Galbraith, the divisions in Germany, and among the nations themselves, have made it clear that the European leadership are poor negotiators […] The institutional players—the IMF, European Community, and ECB—have been constructive […] But the creditors, the active players, are the finance ministers, and they are divided and hostile.” And Galbraith indicates that it comes in particular from the hostility of 3 countries: Spain, Portugal, and Finland. Forbes is also questioning the functioning of the European Union, with an article whose title is “The Greek Crisis Reveals The EU’s Democratic Deficit“. The article is in particular questioning the fact that certain ministers cannot get in writing the documents which are going to be discussed in the Eurogroup ahead of the meeting, with the following comment: “Failure to brief finance ministers adequately before a Eurogroup meeting is negligent, although perhaps understandable in a rapidly-changing situation. It means that the ministers are unable to make informed decisions, so they must either rubber-stamp proposals without considering then properly, or defer everything“. And finally the power is not at the political level, but in the hands of Brussels bureaucrats. Bloomberg, the third of the big US business magazine, has published two devastating articles: the first one (Title: The IMf’s Big Greek Mistake“) is putting the blame of the present situation on the IMF and suggests the following: “Having failed its first Greek test, the IMF risks doing so again. It remains trapped by the priorities of shareholders, including in recent years the U.K. and Germany. To reassert its independence and redeem its lost credibility, it should write off a big chunk of Greece’s debt and force its wealthy shareholders to bear the losses“. The second article (Title: “Greece and Germany Agree the Euro Can’t Work“), mentions that Monday Summit’s available choices go from bad to terrible: “Whatever happens at the leaders’ meeting — even if a deal of some sort emerges — the EU has suffered lasting and perhaps irreparable damage” and the editorialist explains the following: “Europe has suffered a total breakdown of trust and goodwill. That can’t easily be undone — and it’s a dagger pointed at the heart of the entire project. Two things, I believe, will strike historians as they look back on this collapse of European solidarity. The first is that the principals were able to draw such a poisonous dispute out of such an easily solvable problem. The second helps to explain why that was possible: Greece and its partners fell out thanks to a delusion they have in common — the idea that sharing a currency can leave fiscal sovereignty intact“. And the conclusion is that with countries refusing to accept to let go of their fiscal sovereignty, the eurozone cannot work. During this time, far away from the corridors of the Brussels’ theatre, other moves are ongoing. 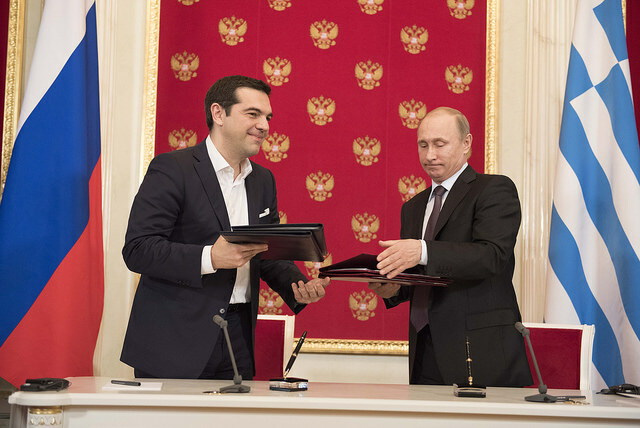 Last Thursday, just before Juhannus (midsummer), Russia and Greece did come to an agreement to build a pipeline through Greece that would deliver Russian gas to the European market. According to the magazine Fortune, “Russia promised Greece hundreds of millions of dollars in transit payments yearly if it agreed to build the pipeline. Construction of the pipeline is expected to start next year and be completed in 2019”. The sum that Greece will receive amounts to 2,77 billion euros, not hundreds of millions. On the Greek side, nothing is excluded. Speaking last week in Saint Petersburg, the Greek Prime Minister Tsipras said the following “We are now in the middle of a great storm. But we are a seafaring nation that knows how to navigate through storms and is not afraid of heading to new seas and reaching new harbours“. These fears, which have been clearly expressed recently in the European medias, are also going to be in the mind of the participants in the Summit on Monday, and will possibly facilitate a solution. Another positive element is the fact that Chancellor Merkel is not necessarily agreeing with her finance minister Schäuble. Der Spiegel has recently detailed the ongoing fight between them on the German scene, stating that “Schäuble is convinced that Europe can only succeed if everyone abides by the rules and Greece is prepared to accept what he calls “conditionality,” in other words, that credit depends on Greece respecting the terms of its creditors. Merkel basically agrees. But a Grexit could upset the financial markets, and then what? She is reluctant to risk looking like she prioritized national interests and undermined the founding principles of the EU“. The main question in Finland is to know what will be the position of the government: will it join a compromise, if Germany is supporting it, or will it be an opponent for local political reasons, joining again Portugal and Spain? That probably depends a lot on Sipilä, and perhaps on Timo Soini, who may be in future history books the man who destroyed the euro by leading the party who obliged the government to refuse the deal… Hard choice some weeks after being elected!